In 1891, the Los Angeles Terminal Railroad Company (LATR) purchased Rattlesnake Island for $250,000 from the Dominguez heirs of Rancho San Pedro. A year later the rail company renamed the mudflat Terminal Island as part of a plan to make it the line's final destination. In 1890, Collis Huntington, owner of Southern Pacific Railroad increased his holdings of Santa Monica waterfront property and began to push Santa Monica as a site for a new southern California port. Meanwhile, San Pedro had been acting as a port location and was anticipating its commercial growth. Conflicts rose between Huntington's private resources and the movement for free enterprise at San Pedro. The federal government was leaning in favor of Huntington until California Senator Stephen M. White took a stand. Early in 1896, he proposed for an independent corps of engineers to choose the site. 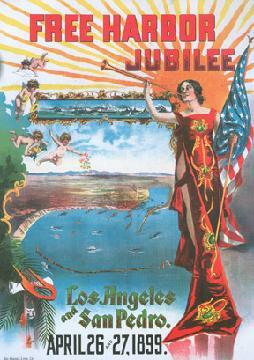 In the summer of 1896, Los Angeles' San Pedro Bay was found to be superior. By 1910, port development at San Pedro and Terminal Island was well underway.